At Whitby Toyota, we place an emphasis on exceeding your expectations. That's why we offer tools and services to make your experience that much more comfortable and easy. Unsure of which vehicle you want? Take your time and get all the information you need before making a final decision. So, Why Buy? Because you can purchase your next new Toyota vehicle from the comfort of your home, at work, or any other location with internet access. For more information, contact or visit us at Whitby Toyota. Choose and Configure Your Vehicle and Set Your Payments. After creating your account, configure your Toyota vehicle when and where you want. Then, save your vehicle in your garage once it is to your liking. You can access your garage from any tablet or computer by logging into your account. Fast and convenient. 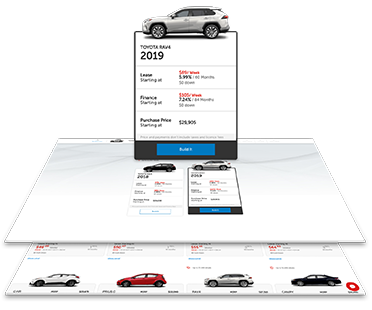 Get a trade-in evaluation of your vehicle in a few clicks! The value of your trade-in is deducted from your total. Complete Your Transaction at The Dealership. Shop when it fits your schedule. See how much time you save with the progress bar. Our tool lets you save up to 1:30 hours! Personalize your Toyota to best fit your needs, budget, and lifestyle. Choose from a selection of colours, trims, and models, all from the comfort of your home or anywhere else available internet. Also, save time and money without current offers and promotions as well as our financial plans. You can also choose the ideal insurance and warranty. Buying online is not only for new Toyota vehicles, find your next used vehicle just the same. At Whitby Toyota, a great deal of thought goes into our used vehicle inventory. So, shop with peace of mind, from any location. Choose your used car and preferred method of payment. Also, save money with our current offers and promotions.